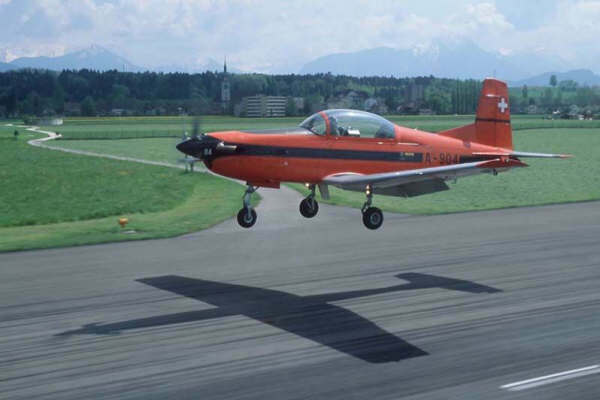 The PC-7 is a training airplane developed by the Swiss company Pilatus. The Royal Netherlands Air Force has 13 PC-7 aircraft which are stationed on Woensdrecht Air Force base. All beginning pilots will start on this plane for 7 months. After completing they'll go to the United States to continue their pilot training. From 2005, all aircraft will painted black with 2 yellow stripes for better recognition from the air traffic control tower. The air force of Malaysia has ordered a 10 PC-7 Mk II turbo trainers for a amount of 53.4 million dollar. Malaysia has also 44 PC-7s and 9 PC-7 Mk II bought before.